The CLASS telescopes are assembled and tested at Johns Hopkins University in the Department of Physics and Astronomy high bay (Step 1 in figure). After a telescope passes all the tests, it is carefully dismantled and packed into several shipping containers, which are loaded on trucks and driven to the port of Baltimore (Step 2 in figure). 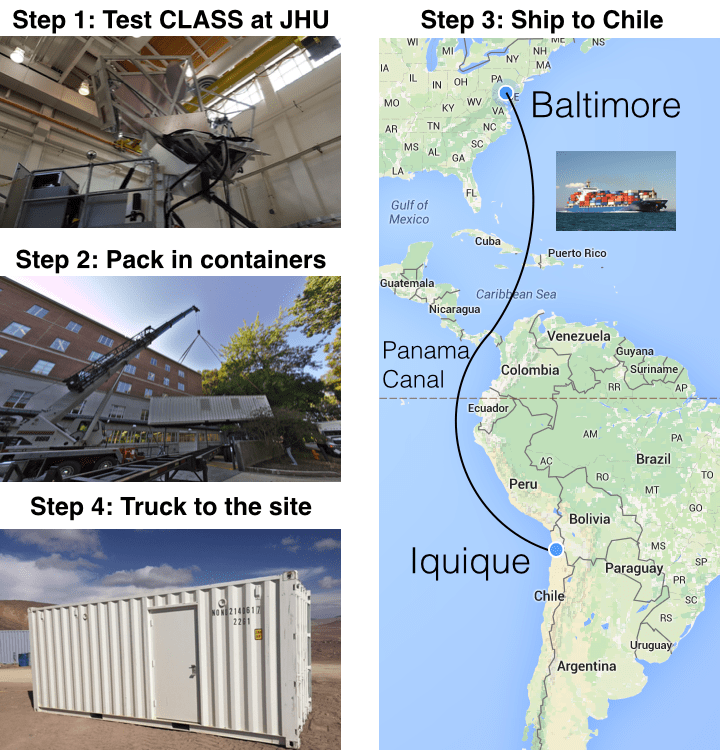 The containers then travel by sea through the Panama Canal to the port of Iquique in northern Chile (Step 3 in figure). Finally trucks take the containers to the site (Step 4 in figure). The total trip takes 5-6 weeks. 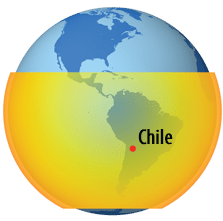 CLASS will make observations from a site located high in the Andes of Northern Chile at an elevation of 5,200 m (17,000 ft). The latitude and longitude of the site are 22°57′35″S and 67°47′14″W. It is in the Atacama Desert, one of the driest places on Earth. Locating CLASS at a high and dry site is important for limiting the negative impacts of microwave emission from water and oxygen molecules in the atmosphere. 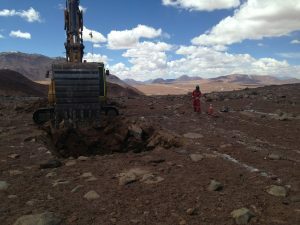 The CLASS site is 40 km from the nearest town, San Pedro de Atacama. Therefore the site is fully self-sufficient, with its own diesel generators, conduit for power and data, a control room, a laboratory, and a machine shop. In 2014 geotechnical and civil engineering studies were carried out to design the telescope foundations. Pits were dug for the foundations and concrete poured on to a reinforcing mesh of iron bars. (See photos.) An archaeologist oversaw the site construction to ensure that no items of paleontological or cultural value were affected. While scientists and engineers work at the high and dry site during the day for maintenance, the team sleeps in the town of San Pedro de Atacama (elevation 2,400 m or 8,000 ft). Data is transmitted from the telescope to our office in San Pedro by a 40 km radio link. This link is also used for sending commands to the telescope. 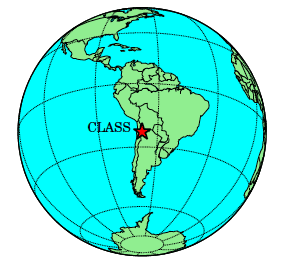 CLASS is located in the Atacama Desert of northern Chile, near the borders of Argentina and Bolivia. 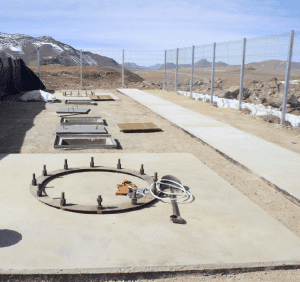 Ground is broken for the CLASS telescope foundations (February 2015) – click to enlarge. The finished CLASS telescope foundations. The iron ring of bolts in the foundation secures the telescope base (June 2015). CLASS site panorama (click to enlarge). 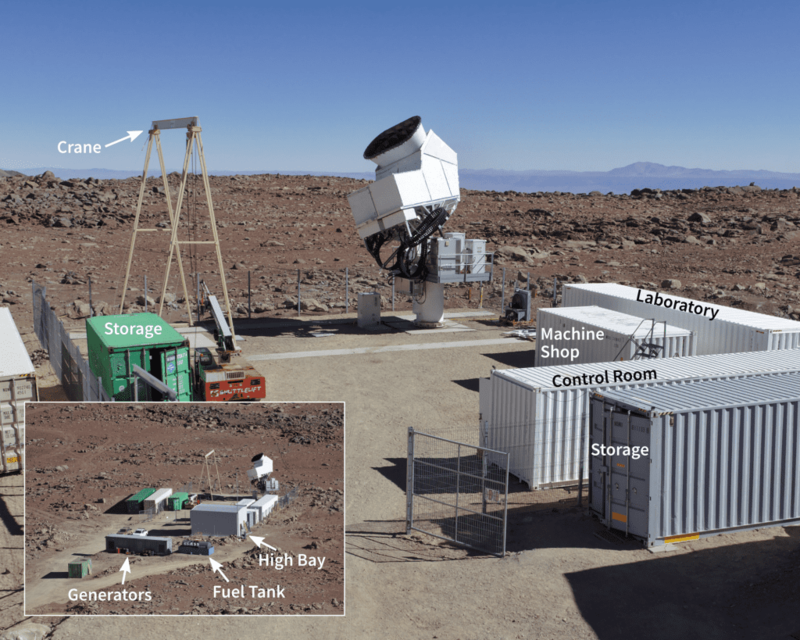 The CLASS team, including students, postdocs, and professors, have installed generator power, a telescope control room, and the first telescope mount at the CLASS observing site in the Atacama Desert. The fully outfitted site is shown in Figure 1. The site is ready to accept the CLASS telescopes. 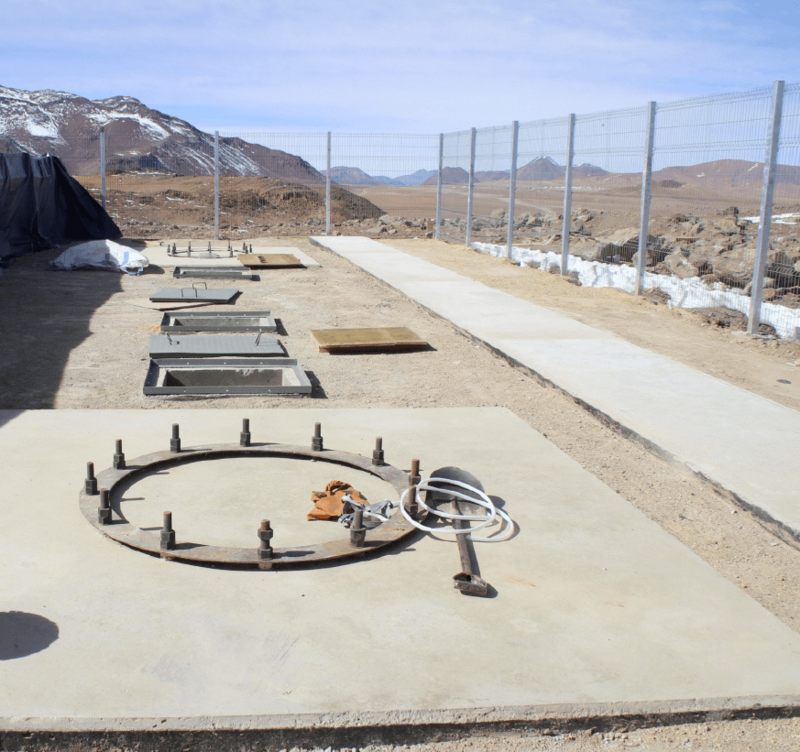 Figure 1: The fully outfitted CLASS observing site in the Atacama Desert at 5200 m elevation. A diesel generator set is in the foreground and the control room and other buildings are within the fenced area. We use the large yellow crane to assemble the telescopes. The tall structure to the right of the crane is the first telescope mount, ready to accept the CLASS telescopes. From the site in northern Chile, the CLASS telescopes measure polarization over 70% of the sky. Astronomers use the concept of the celestial sphere to locate stars, galaxies, and areas of the CMB by means of longitude and latitude in the same way that cities, lakes and mountains are located on the spherical surface of the Earth. Figure 1 shows in orange the section of the celestial sphere over which CLASS measures the CMB. Figure 1: By observing from Chile, the CLASS telescope can capture 70% of the sky. This figure first appeared in the Summer 2014 issue of Arts & Sciences Magazine. At any given time, only the part of the celestial sphere that is above the Earth’s horizon is visible to CLASS. As the Earth rotates, other parts of the celestial sphere rise over the horizon and become accessible to CLASS. In practice, a CLASS telescope points at a fixed elevation above the horizon and rotate about the zenith axis (i.e., in azimuth). In this way the telescope’s field of view sweeps out large circles on the celestial sphere. The CLASS Survey Movie shows an animation of how, over a 24-hour period, CLASS is able to measure the CMB over 70% of the celestial sphere. Every direction of the sky that is observed by CLASS is seen many times a day by different detectors and then again every day. CLASS thus provides tremendous statistical power to distinguish the CMB from other spurious sources of signals. CLASS Survey Movie: Located at the center of the animation, a CLASS telescope (not shown) points with its hexagonal field of view at the celestial sphere. The telescope scans the sky in large circles, which, due to the rotation of the earth, map out the full section (70%) of the celestial sphere targeted by CLASS.